I went fishing for 40 minutes after work on Thursday, the 25th. 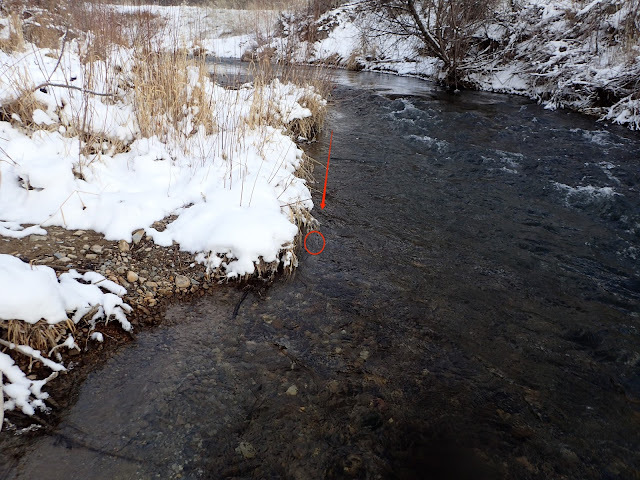 The air temperature was 30°F and I had forgot to bring my gloves, so I didn't fish very long -- just enough to take 5 browns. The sky was grey and flat with high level cloud and there was a little breeze that played around with the #2.5 line that I was using. Still, I was able to control the fly enough to take the fish in some pretty tight spots. I didn't take out my camera for every fish, but I did for a couple of them. One of the browns was taken in shallow water at the inside of a bend in the stream. I placed the UKB right at the seam between the flowing and slack water and let the fly move slowly, swirling in the micro currents, until the fish took it. Another brown was taken within inches of the stream edge. It was holding under some grass that was hanging over the edge. I cast upstream of it, and let the UKB move slowly down along the edge on the stream until the fly reached the grass. The brown then opened it's mouth and took it. All of the fish I hooked were taken using sight fishing techniques. 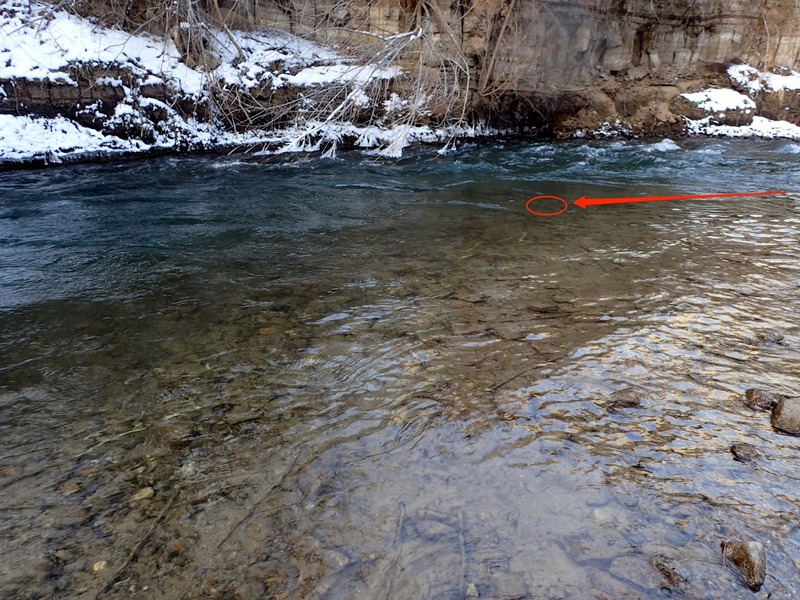 The water temperature was 38°F and I could not get the trout in deeper water to move. Therefore I hunted those that I could see holding in shallow water. My fingers got cold, but 5 browns in 40 minutes on such a cold day was not too bad! I went home pleased (especially since it was on a reach of stream that I hadn't fished in over 25 years). This is my first winter fishing and I have it stuck in my head that I should slowly drift nymphs in deep pools. Obviously you had success elsewhere! Did that surprise you? Based on your comment, it sounds like you hit deeper water initially. Is that your usual approach? I too will fish the deep pools and runs, but when the water is cold I find it hard to move fish to take a fly. The browns where I live will frequently hold in shallow water right next to the bank in cold weather. These seem more willing to take a well placed fly like most ambush predators.